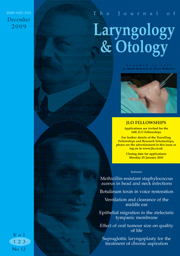 Guy Kenyon, Robin Youngs,	The Journal of Laryngology & Otology, Volume 123 Issue 12, pp 1299-1300. I Brook,	The Journal of Laryngology & Otology, Volume 123 Issue 12, pp 1301-1307. S Khemani, R Govender, A Arora, P E O'Flynn, F M Vaz,	The Journal of Laryngology & Otology, Volume 123 Issue 12, pp 1308-1313. D Cohen, D Raveh, U Peleg, Y Nazarian, R Perez,	The Journal of Laryngology & Otology, Volume 123 Issue 12, pp 1314-1320. I P Tang, N Prepageran, R Raman, T Sharizhal,	The Journal of Laryngology & Otology, Volume 123 Issue 12, pp 1321-1324. G Stamatiou, E Gkoritsa, J Xenellis, M Riga, S Korres,	The Journal of Laryngology & Otology, Volume 123 Issue 12, pp 1325-1330. H G Hatipoglu, M A Cetin, A Selvi, E Yuksel,	The Journal of Laryngology & Otology, Volume 123 Issue 12, pp 1331-1337. D Baring, C Murray, J Singh, A Davidson, M I Syed,	The Journal of Laryngology & Otology, Volume 123 Issue 12, pp 1338-1342. T Kato, Y Kimura, M Sawabe, Y Masuda, K Kitamura,	The Journal of Laryngology & Otology, Volume 123 Issue 12, pp 1343-1347. Y Bajaj, N Sethi, A Shayah, A T Harris, P Henshaw, A P Coatesworth, A R Nicolaides,	The Journal of Laryngology & Otology, Volume 123 Issue 12, pp 1348-1351. K Reid, C Hicks, S Herron-Marx, S Parmar,	The Journal of Laryngology & Otology, Volume 123 Issue 12, pp 1352-1357. N De Zoysa, S Vasani, S Kaniyur, A Frosh,	The Journal of Laryngology & Otology, Volume 123 Issue 12, pp 1371-1374. J E Peters, A D Salama, P W Ind,	The Journal of Laryngology & Otology, Volume 123 Issue 12, pp 1375-1377. S Mittal, A Rohatgi, R P Sutcliffe, A Botha,	The Journal of Laryngology & Otology, Volume 123 Issue 12, pp 1378-1380. Y Kulahci, F Zor, O Onguru, M Bozkurt, H Duman,	The Journal of Laryngology & Otology, Volume 123 Issue 12, pp 1381-1383. M George, A M Augustine, J Mathew, V T Cherian, V K Cherian,	The Journal of Laryngology & Otology, Volume 123 Issue 12, pp 1384-1386. S Ramnani, V Mungutwar, N K Goyal, A Bansal,	The Journal of Laryngology & Otology, Volume 123 Issue 12, pp 1387-1389. P Kataria, J C Passey, A K Agarwal,	The Journal of Laryngology & Otology, Volume 123 Issue 12, pp 1390-1392. S Izadi, P D Karkos, R Krishnan, J Hsuan, T H J Lesser,	The Journal of Laryngology & Otology, Volume 123 Issue 12, pp 1393-1395. B G Fennessy, R Rahbar, N Bunker, F Pigula, A Casta,	The Journal of Laryngology & Otology, Volume 123 Issue 12, pp 1396-1398. D V T Harischandra, J Swanevelder, R K Firmin,	The Journal of Laryngology & Otology, Volume 123 Issue 12, pp 1399-1401. P Baptista, C V Gimeno, F Salvinelli, V Rinaldi, M Casale,	The Journal of Laryngology & Otology, Volume 123 Issue 12, pp 1402-1403. T E O'Connor, T Cooney,	The Journal of Laryngology & Otology, Volume 123 Issue 12, pp 1404-1406. G Kalra, J Keir, J Tahery,	The Journal of Laryngology & Otology, Volume 123 Issue 12, pp 1358-1359. P K M Ku, V J Abdullah, A C Vlantis, K Y S Lee, A C van Hasselt, M C F Tong,	The Journal of Laryngology & Otology, Volume 123 Issue 12, pp 1360-1363. Y Oestreicher-Kedem, T G Dray, E J Damrose,	The Journal of Laryngology & Otology, Volume 123 Issue 12, pp 1364-1366. K W Heo, M J Baek, S K Park,	The Journal of Laryngology & Otology, Volume 123 Issue 12, pp 1367-1370.